Leave the gun, take the puppy. JOHN WICK serves as one more exhibit in the damning case against Hollywood's conventional wisdom. People who should know better seem shocked that it opened well at the box office. Granted, a revenge shoot-em-up directed by stunt players (David Leitch and Chad Stahelski) may not be everybody's idea of the perfect date movie, and you wouldn't want to bring the children. But John Wick is so exciting, so consistently entertaining that I can't imagine it not being a hit. Then again, I'm not in charge of distribution for a major studio. I like fun, concise exercises in cinema more than bloated comic book adaptations. What do I know? Keanu Reeves is the eponymous badass: the best, most prolific contract killer in an imaginary East Coast crime universe. When he falls in love, he leaves the life, after having completed Herculean feats of mayhem for his bloodthirsty boss Viggo (Michael Nyqvist). After a brief period of wedded bliss, Wick's wife succumbs to illness, leaving him alone and directionless. On the day of her funeral a package arrives on his doorstep. Inside, a puppy and a note from the dearly departed, imploring him to open his heart to the dog and continue on. 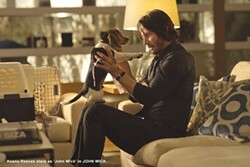 The unexpected gift reopens the world, if only a little bit, and Wick feels an immediate bond with Daisy the dog. Then some scumbags break in to his house, kill Daisy in front of him and steal his Mustang. It's a bad day for our hero, and the first of many for the men who done him wrong. As it turns out, the scumbags in question work for Viggo and include his son Iosef (Alfie Allen), so Wick goes to war against his former employer. What follows couldn't seem simpler: a series of bloody, bullet-riddled action sequences. History has shown, though, that this sort of thing is deceptively difficult to pull off. For every movie that succeeds at it, there are dozens, if not hundreds, of pale, laughable imitators. And John Wick succeeds more resoundingly than anything I've seen in a long time. There isn't much story to speak of, beyond the brief exposition described above, but there doesn't need to be. Reeves exudes capable cool with an undercurrent of sorrow and wrath as he navigates the colorful, imaginatively constructed world of the movie. The production design and cinematography are atmospheric and inventive without excess showiness, and the editing works in service of the brilliant fight choreography and stunt work that really define the thing. I'm sure not all stunt player/coordinators have the visual style and story sense of Leitch and Stahelski, but if they are any indication, the director's guild might be in trouble. John Wick knows exactly what its game is, and unfailingly accomplishes everything it sets out to. It's a little silly sometimes, and probably too violent for some, but those elements are part of what makes it great. I've seen a lot of movies that have tried to achieve this effect, and none of them carried it off with such charm and vigor. R. 101m. ST. VINCENT is another little genre movie that exceeds initial expectation. We've all seen at least one example of the grumpy old man next door turning out to have a heart of gold. But in this case, a careful script and excellent performances elevate the material. In the midst of a bad divorce, Maggie (Melissa McCarthy) and her son, Oliver (Jaeden Lieberher), pull up stakes and move to Brooklyn. Their neighbor Vincent (Bill Murray) would appear to be, and for the most part is, a hard-drinking, pony-betting misanthrope. He divides his days between the track, the bar and the embrace of Daka (Naomi Watts), a pregnant dancer/call girl. When Oliver has a bad day at school that results in the theft of his wallet, phone and keys, he and Vincent are thrown together by circumstance. The two take a shine to each other, and Vincent becomes the de facto babysitter. Through Oliver's eyes we learn that, despite appearances to the contrary, the old man actually does have love in his heart. He shares a little of it with the kid, albeit reluctantly, saving most of it for his care-home-bound wife, Sandy (Donna Mitchell), so consumed by dementia that she doesn't recognize him. Things get inevitably complicated by illness, the escalation of Maggie's divorce and the back-monkey of financial burden, and then resolve themselves satisfyingly, if predictably. The story is sweet, simple and well observed, but the performances, especially by Lieberher, are worth the price of admission. Chris O'Dowd is a standout, too, in a supporting role as Oliver's teacher. PG13. 103m. BEFORE I GO TO SLEEP. Nicole Kidman goes all Memento as a woman whose memory is wiped clean every night and who's starting to distrust the people in her life. R. 92m. NIGHTCRAWLER. Jake Gyllenhaal plays a citizen journalist racing between Los Angeles crime scenes and stepping over bodies and ethics in this suspense thriller. R. 117m. SAW (10TH ANNIVERSARY RE-RELEASE). Boy meets saw all over again. R. 103m. ALEXANDER AND THE TERRIBLE, HORRIBLE, NO GOOD, VERY BAD DAY. A luckless kid helps his family through their own comic rough patch. With Steve Carell and Jennifer Garner. PG. 81m. THE BEST OF ME. Another Nicholas Sparks adaptation in which beautiful people return from the past to find love and great lighting. Starring James Marsden and Michelle Monaghan. PG13. 118m. THE BOOK OF LIFE. Zoe Saldana, Diego Luna and Channing Tatum voice a Dia de los Muertos-themed, animated adventure with a story that's not as rich as its visuals. PG13. 118m. DRACULA UNTOLD. Luke Evans is armed to the teeth in this origin story for the legendary bloodsucker. PG13. 92m. THE EQUALIZER. R. Denzel Washington plays a trained killer out of retirement to champion a working girl in this pacey, atmospheric and inventive action movie.132m. FURY. Director David Ayer's drama about the simple evil of war and the complex team of men who fight is his finest work to date, and one of the best films of the year. Starring Brad Pitt. R. 134m. GONE GIRL. An engaging, entertaining and tightly controlled thriller with a fine ensemble cast and standout performances from Ben Affleck and Rosamund Pike. R. 149m. THE JUDGE. A flashy lawyer defends his estranged father, a small-town judge, in a murder trial. On-the-nose seriousness and sentimentality undermine solid work by Robert Downey Jr. and Robert Duvall. R. 142m. THE MAZE RUNNER. A tightly paced sci-fi/horror flick for the tween set that loses the thrill in the end. Spoiler: There's no cheese. PG13. 113m. OUIJA. It's going to be super disappointing if we find out somebody was pushing it. PG13. 90m.